Gracefully reflecting the cavalier era of the late seventeenth century, this magnificent 100-gun battleship of King Charles II is depicted under the command of Lord Russel, seeking the French fleet in 1692 following the Battle of Barfleur. In 1692, Britannia became Lord Russell’s Flagship under William & Mary and engaged in direct combat with the prized French Flagship Soleil-Royal (serving under Conte de Tourville). Outnumbered and fatigued, the French were forced to retire. Heavily pursued by the British, most of their fleet, including Soleil-Royal, were forced ashore, destroyed, and burnt. The battle was more than a victory for the British; it marked a pivotal point for the French, whose sea power fell into a decline that would continue into the following century. And so it was that Britannia, although having only once engaged in such fevered battle, landed a role that would establish her placement among the British Navy’s most famous warships. She remained in service until 1715. Charles II’ s magnificent flagship was a 100 gun 3-decked line of battleship. 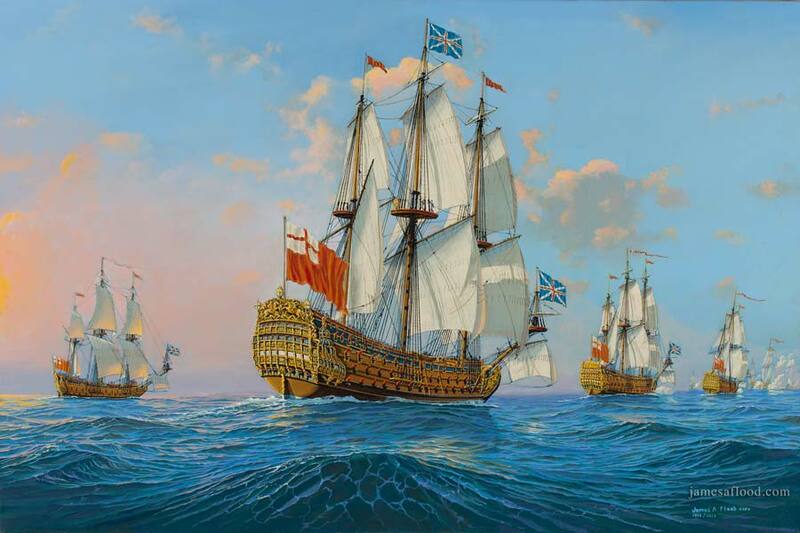 Built in Chatham, England, and launched in 1682, the Britannia was the biggest ship of Charles II’s Thirty-Ship program. She was originally designed (by Sir Phineas Pett II) with a beam 16” in excess of its specifications in order to balance a heightened main battery. The Admiralty rejected the increased beam width, although they held the battery at its new level. It was not until her commissioning several years later, when, loaded with weaponry, it was discovered that Britannia was too top heavy to fight. She was withdrawn from service for modification and returned, refitted with a girdle of fir. It increased her beam from 47’ 4” to 48’ 8”. (Pett’s original sixteen inches).